Today, June 13th, 2017, the Equal Justice Initiative, with support from Google, is shedding new light on this chapter in American history with Lynching in America: Confronting the Legacy of Racial Terror, an interactive experience that brings their groundbreaking research on this racial violence-and the personal stories behind it-online. The Equal Justice Initiative is a nonprofit challenging racial injustice both in and out of the courtroom. The organization’s founder, Bryan Stevenson, believes that we cannot truly move forward as a nation until we confront this dark chapter from our past. Google is committed to making information universally accessible, so that everyone has the knowledge to better understand-and contribute to-a more just world. Together we share a commitment to creating a more inclusive society and leveraging data to fight inequities, which is why Google.org is proud to further increase our support for EJI, which began in 2016. 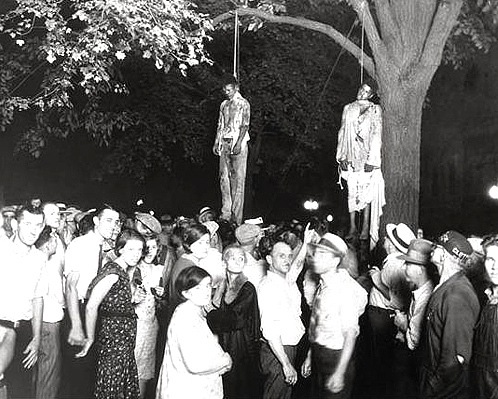 Based on EJI’s original publication of the same name, Lynching in America: Confronting the Legacy of Racial Terror reveals both the scope of lynchings of African Americans between 1877 and 1950 and the profound way in which this era continues to shape our nation,particularly in our criminal justice system. Racial disparities continue to burden people of color; the criminal justice system is infected with racial bias; and a presumption of dangerousness and guilt has led to mass incarceration, excessive punishment, and police violence against people of color. If current trends continue, one of every three black boys born in America today will be imprisoned. The Lynching in America site brings together EJI’s in-depth research and data with the stories of lynching victims, as told by their descendants. Through six audio stories, and a short documentary, Uprooted, you both hear and feel the impact of this dark time in history on generations of families. You can also explore an interactive map that includes incidents of racial terror lynchings, as well as in-depth profiles of the stories behind these acts of violence. In bringing EJI’s work to a wider audience, we hope to give all of us an opportunity to address our past and be part of the work of building a more just and equitable future.